In another fortnight, Akshay Kumar's much awaited Chandni Chowk To China which also starrs Deepika Padukone will hit the screens. The new star of Bollywood says that the basic idea behind the film was not a story, not an actual idea, but a poster. In an interview to NDTV's Anupama Chopra, Akshay Kumar spoke about the journey from Chandni Chowk to Bangkok and that to China. Anupama Chopra (AC): Akshay you are going to begin this year with a very exciting project, Chandni Chowk To China and there has been a lot of conversation about this film being autobiographical, but other than the fact that it echoes your journey from Chandni Chowk to Bangkok how is it autobiographical? Akshay Kumar (AK): That's all. Actually that is the only resemblance. I was born in Chandni Chowk, this character is also born there and he learns to cook. I am playing a halwai in the film by the way. AC: You are a halwai? AK: I am playing a halwai, it's just a character. This guy goes from Chandni Chowk to China to learn martial arts. This is another similarity between us. AC: So was this by design or did they take it from your life? AK: Yes, I designed the whole thing for them. Before Warner Brothers came in, Rohan Sippy got me a design of me standing like in that pose. The film was called 'Mera Naam Chin Chin Chu'. 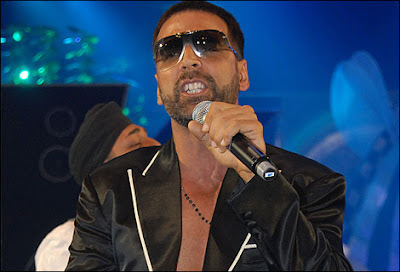 He said, "Akshay I want to make a film." I said, "Okay, what's the story?" "I don't have a story." "Okay do you have an idea?" I don't have an idea." "Alright, you have a producer?" "I don't have a producer." Sso what do you have?" "I just have this poster, this is the main poster." His idea was this poster he had made in front of me. This is the first film I've done without listening to anything. I told him I wanted to do this film. AC: Purely on the poster? AK: On the poster. You know, sometimes it's your instinct. I don't know whether it's going to be right or wrong. That we will come to know later, when the movie releases. This guy is a chef who goes to learn martial art. Bas yehi idea tha (That's all the idea there was). Let's make it on my life and let's do it. Rohan said,"...give me about three months and I'll come back. He didn't come back to me in three months. When he did come he told me that he has a small idea and that he has got Warner Brothers to produce it. And from there it took off.